Achieve accurate quotes by avoiding pricing mistakes Charity Jackson is co-owner of Visual Horizons Custom Signs based in Modesto, California. She has been in business since 1995, and has worked in the sign industry for over 25 years. You can visit her website at www.vhsigns.com. 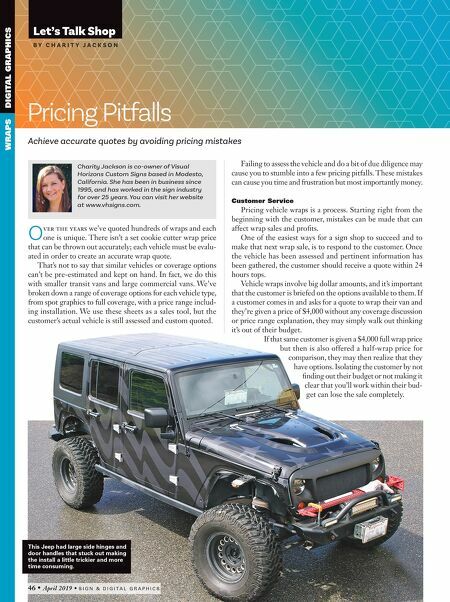 Failing to assess the vehicle and do a bit of due diligence may cause you to stumble into a few pricing pitfalls. These mistakes can cause you time and frustration but most importantly money. Customer Service Pricing vehicle wraps is a process. 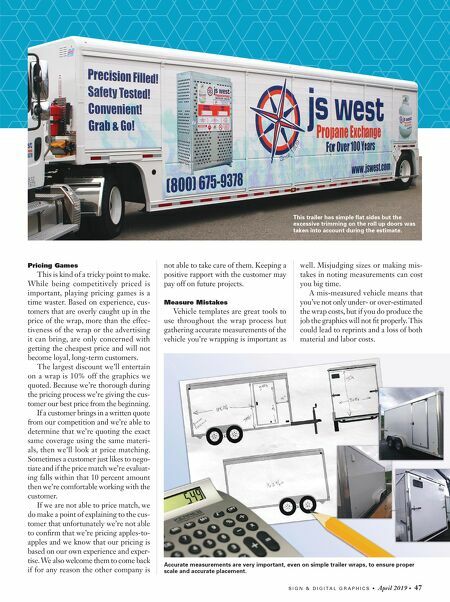 Starting right from the beginning with the customer, mistakes can be made that can affect wrap sales and profits. One of the easiest ways for a sign shop to succeed and to make that next wrap sale, is to respond to the customer. Once the vehicle has been assessed and pertinent information has been gathered, the customer should receive a quote within 24 hours tops. Vehicle wraps involve big dollar amounts, and it's important that the customer is briefed on the options available to them. If a customer comes in and asks for a quote to wrap their van and they're given a price of $4,000 without any coverage discussion or price range explanation, they may simply walk out thinking it's out of their budget. If that same customer is given a $4,000 full wrap price but then is also offered a half-wrap price for comparison, they may then realize that they have options. Isolating the customer by not finding out their budget or not making it clear that you'll work within their bud- get can lose the sale completely. O ver the years we've quoted hundreds of wraps and each one is unique. There isn't a set cookie cutter wrap price that can be thrown out accurately; each vehicle must be evalu- ated in order to create an accurate wrap quote. That's not to say that similar vehicles or coverage options can't be pre-estimated and kept on hand. In fact, we do this with smaller transit vans and large commercial vans. We've broken down a range of coverage options for each vehicle type, from spot graphics to full coverage, with a price range includ- ing installation. We use these sheets as a sales tool, but the customer's actual vehicle is still assessed and custom quoted. B Y C H A R I T Y J A C K S O N Let's Talk Shop WRAPS DIGITAL GRAPHICS Pricing Pitfalls 46 • April 2019 • S I G N & D I G I T A L G R A P H I C S This Jeep had large side hinges and door handles that stuck out making the install a little trickier and more time consuming.